Pretty yarn! But… get sewing!!! Yah sure, you kind of have to like them ’cause there is no escaping them here in Minn-a-so-ta! 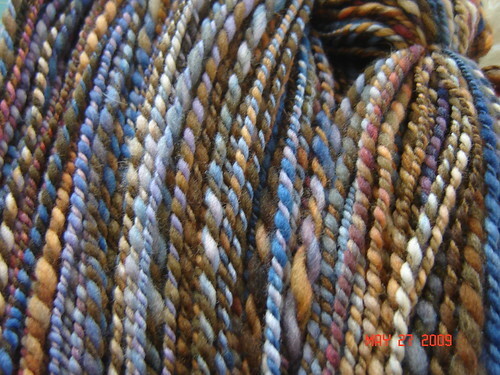 Beautiful fiber! I’ve been spinning like a crazy girl too. Must be the weather…. I think spinning is in the air. It’s all I’ve been wanting to do too. I’ve hardly seen heirloom baptism gowns these days. I think that the Japanese fabric certainly will stand out though! I finally sat down to spin yesterday after a long hiatus. *sigh* It’s such a wonderful, relaxing thing to do. I love your yarn!